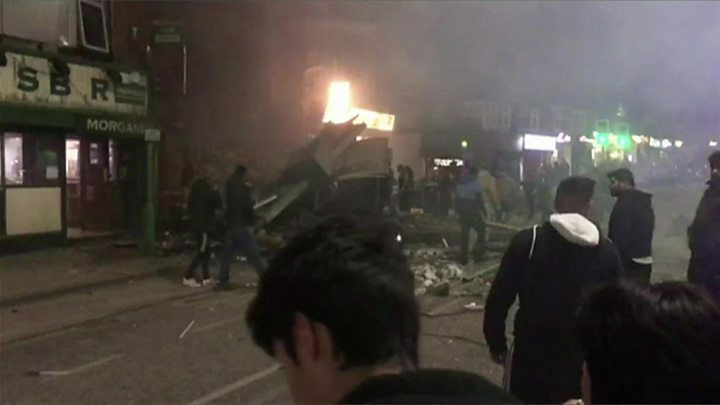 Media Signature BBC journalist John Alexander: "There has been a big explosion"
Four people were hospitalized after reports of an explosion and a fire in the Hinckley Road in Leicester. A police spokesman said, "At this stage, there is no indication that this is related to a terrorist." Carlisle Street and part of Hinckley Road have been closed and people are being asked to shun the area. Six fire engines have been on the scene, Leicestershire police said. Flames could be seen rising from a building in the middle of a parade of shops. BBC journalist John Alexander said the explosion had "thrown debris and boulders over four lanes". He said the emergency services had cordoned off about 60 homes in the area and people had been evacuated for a "huge" building "fire." A spokeswoman for Leicestershire Fire and Rescue Service said they had been involved in a "search and rescue operation." The affected property was a two-story, top-floor building that suffered a "pancake collapse," she said. All four victims were taken "The loan-Roy al Infirmary, "said the rescue service, and the crews stayed at the scene. The hospital said all four patients were in critical condition and urged people not to participate in A & E unless "absolutely necessary"
Alpana Marwaha, who lives nearby, told the BBC: "I heard a bang and the house shook, we could see the flames." "You can still see the smoke and the emergency services. There are few shops and it is surrounded by houses. "She added that it was worrying to be so close to the explosion, and she hoped the authorities would justify their cause. Images and Videos on Social Media The media seemed to be showing a shop that went up in flames the flame was visible from afar. Have you witnessed an explosion in the area of ​​Hinckley Road in Leicester? 19659030] haveyoursay@bbc.co.uk .